This lesson shows you how to use the clipboard by appending data to it, allowing the user to build up a piece of text and then paste it. The UI for this example consists of a field containing some text, a button allowing the user to append the selected text to the clipboard and a label field informing the user how many characters are currently on the clipboard. This handler is based on the clipboardData property. The clipboardData contains whatever is currently in the clipboard: plain text, styled text, image data, or files, stored in an array whose keys are the data types that the clipboard can hold. 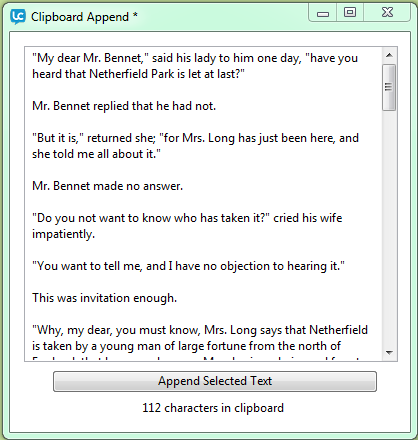 The appendSelectionToClipboard handler takes the selected text and adds it to the end of the text on the clipboard, letting you accumulate text, instead of wiping out what was already on the clipboard. If there is a text selection, the handler appends it to the end of the clipboard contents. It does this by setting the "text" element of the clipboardData array. The expression the clipboardData["text"] refers to the plain text on the clipboard; the handler sets this property to the current clipboard text and the selected text, separated by a return. If you use the appendSelectionToClipboard handler repeatedly, the text accumulates, one entry per line. When you choose Edit -> Paste, all the accumulated text is pasted. Finally the handler displays the number of characters stored on the clipboard. put the length of the clipboardData["text"] && "characters in clipboard" into field "clipboard length"
appendToClipboard "Hello world" ## adds "Hello world"
Another way to modify the original handler is to change other parts of the clipboardData array to allow clipping styled text. Because this handler specifies the clipboardData["text"], it's only capable of handling plain text with no styles. If the clipboard already contains styled text, setting the "text" element of the clipboardData causes the styles to be lost. The expression the htmlText of the selectedChunk evaluates to the selected text, along with its style information, in HTML format, so this variation includes the style information that goes with the selected text. The "<p></p>" is the htmlText equivalent of the return used in the original handler.